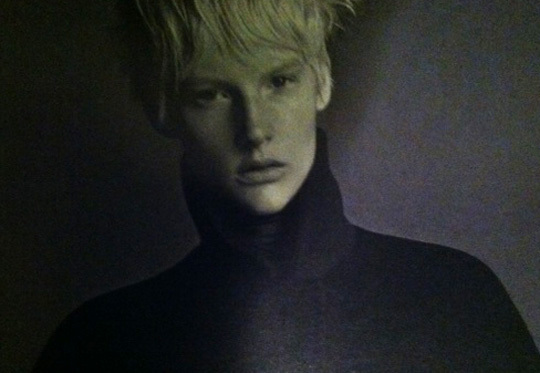 WSJ Fall Fashion issue: Is androgynous the new black? Is androgynous the new black? Take a look at the Wall Street Journal Fall Fashion issue and you’ll notice a trend — maybe sorta kinda women who are supposed to be models. I’m assuming the photographer just didn’t apply eye makeup in order to de-emphasize her eyes? Or maybe the WSJ just hired women with more masculine features and accentuated them? Am I wrong? Why does this woman have a cleft chin? Am I supposed to attracted adolescent boys now? Peter Pan in red lipstick? 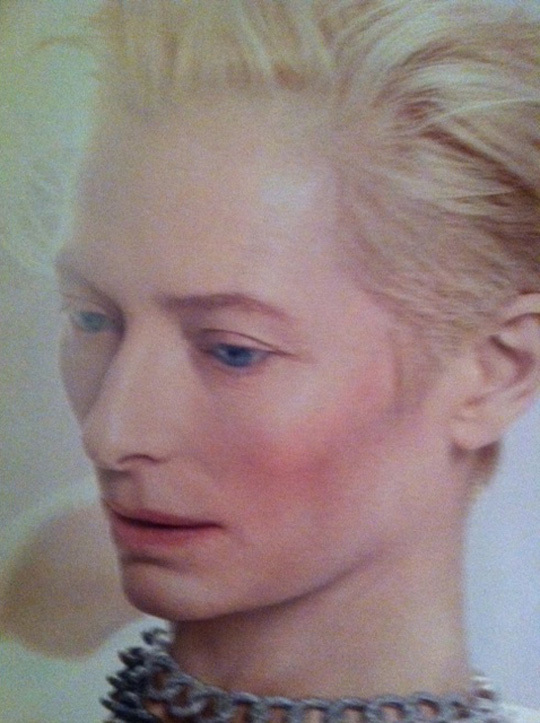 Tilda Swinton is the key here; she played Archangel Gabriel in 2005’s Constantine. It’s hard not to think that the Wall Street Journal is trying to push fashion better suited for David Bowie’s gender-bending days with its fall fashion issue. I love Bowie’s music, but I don’t enjoy looking at him. 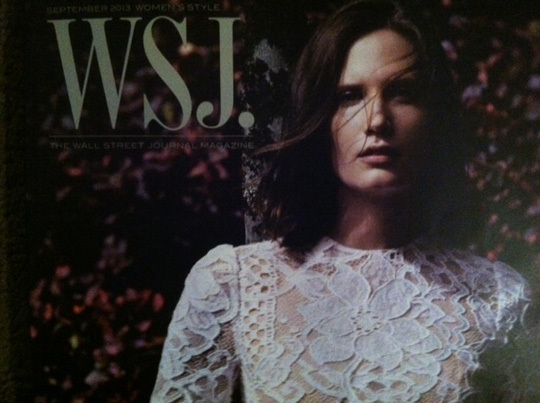 In short, the Wall Street Journal needs more women who look like … women. Kate Upton would be a good start. Yeah, I prefer women that look like… actual women. 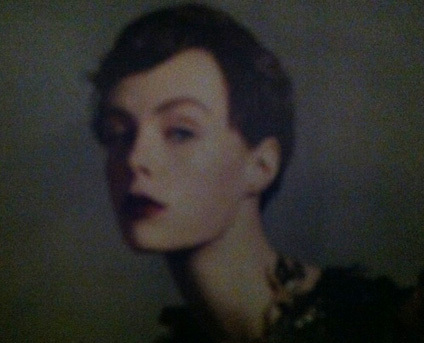 Androgynous women aren’t my thing. And I agree with Joysy… the whole “alternative lifestyle” push is getting ridiculous. Reminds me of how the MSM is going out of its way to promote Bradley Manning’s transgenderism… it’s pretty pathetic. In regards to Gabriel, I’ll pass in this instance on a debate regarding what an archangel is, who is designated as one, etc. The post would quickly veer off track. That’s soo mean Douglas!! Those are still women with feelings and some of those same looking women might read your blog too. Now about the matter at hand, if WJS is trying to push a certain look I can never agree with that because I don’t respect WJS or this whole culture of “change” that we’re going though currently. I’m not highly into fashion although I do like some of it but as far as I’ve seen that’s how it’s always been in “high fashion”. The women are made to be gaunt, walking hangers for the designer’s clothes so the audience looks more at the clothing than the one who’s donning it. That never made much since to me to begin with but I think the lot of them are a bunch of crazies. Who wants to look at clothes (if you can call some of them that) that folks can’t picture themselves in by way of models who eat? “The women are made to be gaunt, walking hangers for the designer’s clothes so the audience looks more at the clothing than the one who’s donning it,” (Tempress). Every single one of the models shown in this piece could be done up in a way that would accentuate their feminine features. For this job it seems rather obvious that a decision was made to play up masculine features and to make us comfortable with (or attracted to) androgyny. 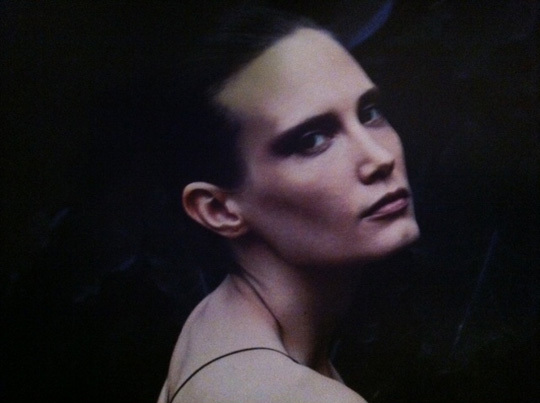 That isn’t a critique on the self worth (or the natural beauty) of the models; it is a critique of those hired to create the WSJ’s Fall Fashion Issue. With that said, even if I did use your own observation about high fashion models and compared them to “walking hangers,” would that be mean? They’re professionals. They chose to put themselves out there. They are paid handsomely (no pun intended). If I am not attracted to them and voice that via a blog entry, I’m not sure how that’s mean. In fact, I’d say that this post was rather tame. Beauty is only a lightswitch away … and ..
Oh .. I’ll vote for Kate Upton too. I’m on vacation and as I was writing this I said to my family: “Name a good modern model.” My dad replies, “Kate Upton.” My mom and my wife gave him a surprised look because he’s usually pretty reserved; we all probably assumed he’d sit that one out. I just laughed and said, “Good one, dad!” WSJ 0, Kate Upton 3. I was thinking Mr. Thicke went with the Beetlejuice inspiration, myself. I debated whether or not I should post on the VMAs. When Ms. Cyrus says she doesn’t care what anyone thinks … in this case it’s really a cry for help. She is not well. Ms. Cyrus is another example of how Hollywood loves “edgy and controversial” stuff, but disdains wholesomeness and decency. Yet another fallen former child actress/singer that’s going to join the ranks of people like Lindsay Lohan and Amanda “Obama should Arrest the Cop that Arrested Me” Bynes. And I’m sure when everything comes crashing down on her, she’ll find someone else to blame for her problems. People (actors/performers-presidents-monarchies-And so forth) Shine like luminaries to the world for a while. Then they fall like so many stars do.